We know that flash video FLV and F4V can not support by FCP/FCP 7/FCP X. So if you have many FLV or F4V movies stored on PC, you may need to transcode and edit the flash videos (*.flv, *.f4v) for Final Cut Pro 7/X. UFUSoft Mac F4V/FLV Video Converter is the recommended FLV/F4V to Final Cut Pro 6/7/X converter for you to make all Flash videos and YouTube videos (*.flv, *.f4v) edit on Final Cut Pro 6/7/X. 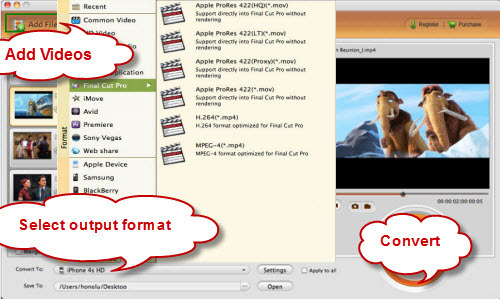 Here is the step-by-step guide for you to import and edit Flash videos FLV/F4V to Final Cut Pro 6/7/X on iMac/MacBook Pro with Mac OS X like Mountain Lion, Lion, Snow Leopard. Step 1. Load Flash videos FLV/F4V to F4V Video Converter for Mac. Run UFUSoft Video Converter for Mac as the best Mac F4V Video Converter, and click the “Add” button to load .flv /.f4v videos. Step 2. Choose Final Cut Pro – Apple ProRes (*.mov) output format. Click the “Format” option and navigate the mouse cursor to Final Cut Pro > Apple ProRes 422 (*.mov) as output format. The Mac FLV/F4V to FCP 6/7/X Converter will convert flash video flv/f4v to Apple ProRes 422 MOV with high quality. (Tip: The Apple ProRes (*.mov), DVCPROHD (*.mov), HDV (*.mov) formats under Final Cut Pro output profile are available when your FCP is installed on Mac). Select all files and click Merge, and the Mac Flash FLV/F4V video converter will join and combine the video clips into a single file as output. Step 4. Convert Flash Videos FLV/F4V to MOV for Final Cut Pro 6/7/X. Click the convert button under the preview window, the Mac F4V video converter starts converting flash flv/f4v videos to ProRes .mov, and joining the flash flv/f4v files for editing in Final Cut Pro 6/7/X. After converting and merging the FLV/F4V files, just import the output files to Final Cut Pro 7 and the video is in origianl setting. You can also import the output videos to Final Cut Express (FCE) 4 for editing.